Just a quick glance at the twisted light posts outside the 21c Museum Hotel Lexington will assure visitors something special awaits. Located in the restored historic Fayette National Bank and Trust Co. building on Main Street, this museum is currently home to OFF-SPRING: New Generations through May. A collection of photographs, paintings, videos and sculptures exploring the theme of identity are featured throughout. I don’t always comprehend contemporary art, but I’m willing to give it thoughtful consideration. Certainly, I appreciate the work and the effort each artist devotes to his or her creation. I like to examine the piece, analyze my thoughts and arrive at my own simplistic interpretation. Then, I will look for and read the plaque explaining the artist’s description. Rarely do the two line up, but I know that’s ok. This particular exhibit includes emotionally-laced, thought-provoking pieces, and they are displayed on multiple floors. On the wall opposite the hotel reception desk is a rectangular table draped in white. A multi-tiered wedding cake sits at the center with head-size video screens on either end. On the left, we presume, is the image of the bride. And on the right is the groom. Each is engrossed in electronic devices while a projection of a mouse, unnoticed by the preoccupied couple, consumes the cake. The significance of this creation was not lost on me. In one room, delicate materials and laces are arranged and illuminated from floor to ceiling in what, to my eyes, appears to be a mushroom cloud. As I read the artist’s description of The Dream, I learn the arrangement is, indeed, a mushroom cloud. Beyond that, though, I couldn’t have known the South African artist Frances Goodman created a representation of the answers she’d received after interviewing unmarried women in South Africa regarding their thoughts on marriage. 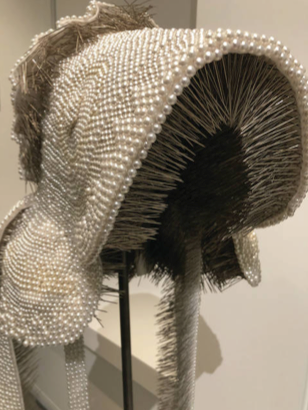 A particularly fascinating creation is a pair of bonnets constructed out of pearl corsage pins. Thousands of them. While the elegant pearls are pleasing to the eyes, the pin points located inside of the bonnet are unsettling. The bonnets, according to the description provided by artist Angel Ellsworth, are religiously symbolic. Nearby stands a statue of a young boy holding a brush in one hand and a bat in the other. The attention to all of the details of his lifelike facial features is impressive. But, I couldn’t even guess as to what that artist wanted to convey: a child living with guilt that doesn’t belong to him. The contemporary art gallery is open 24 hours a day, 365 days a year, and visitors do not have to be guests of the hotel to experience the unique museum, which makes for a great destination or as a side stop for those with other plans in the downtown Lexington area.